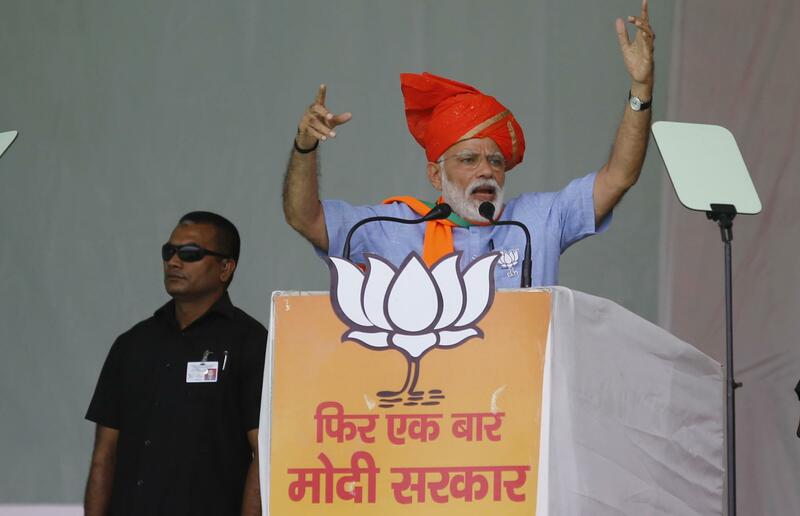 JAMMU: In a blistering attack on dynastic politics, the Prime Minister Narender Modi today said that two families—that of the Abdullahs and the Muftis--have spoiled the future of three generations of Jammu and Kashmir. He accused the National Conference (NC) and Peoples Democratic Party (PDP) of trying to “secede J&K from India”, an attempt which he will not allow. Asserting that NC and PDP’s demand for separating Jammu and Kashmir from India has been exposed like Pakistan's nuclear threat had been "deflated", Modi reiterated that he was committed to resettle Kashmiri Pandits in the valley and to provide citizenship rights to PoK and West Pakistani refugees who settled in State after migrating from across the border decades ago. Modi was addressing an election rally in Kathua—his second in less than three weeks in state-- in support of Union minister Jitendra Singh who is seeking re-election from Udhampur parliamentary constituency. “The Abdullah and Mufti families have "ruined" three generations in the state. They laid seize to the state for three generations. For the better future of the state, they need to be voted out,” he told the rally. “Jammu and Kashmir is not personal property of dynasts and no one can separate J&K from India as it is an integral part of our country and each and every person living here is citizen of India. “I want to tell Mufti and Abdullah family that even if you bring your entire clan together, you won’t be able to secede J&K from India and disintegrate our country,” Modi said. “I want to tell them, Modi na jhukta hai aur na hi bikta hai," Modi said, while adding, “I will not allow Abdullahs and Muftis to divide the country and secede J&K from India. I am standing like a rock against all nefarious designs against my country”. He said that ouster of these 2 families is must for the bright future of the people of J&K. “The bright future of Jammu and Kashmir can be ensured only after their departure. They can bring their entire clan into the field, can abuse Modi as much as they want but they won't be able to divide this nation,” the prime minister said. He was referring to NC leader Omar Abdullah's demand for a separate prime minister for Jammu and Kashmir and Mehbooba Mufti's remark that abrogation of article 370 can lead J&K free from India. “Congress didn’t do justice with the army by questioning surgical strike and air strike,” he said adding, “This is Congress’ old habit to hide its failures”. Terming Congress, the NC and PDP a "highly impure coalition", Modi said that day in and day out they (NC and PDP) are threatening to sever J&K from India. "They threaten of blood shed... of a separate Prime Minister." Taking a dig at them, he said that Pakistan was also threatening us with nuclear (power)? "Has steam of that nuclear threat fizzled out? ", he poses question to people. People responded with yes. While appealing people to vote for BJP for a stronger India, Modi said that he has visited across length and breadth of India during campaigning and he can sense that here is a stronger wave and undercurrent in favor of BJP this time. “BJP’s victory in J&K would give sleepless nights to many people across the border which I can sense,” he said. Modi said he is committed to resettle Kashmiri Pandits in the valley and to provide citizenship rights to PoK and West Pakistani refugees who settled in Jammu and Kashmir after migrating from across the border decades ago.